The M/S Sunrise Semiramis 1 & 2 are 5 star deluxe Cruisers and offer the perfect way to enjoy a Nile Cruise with fantastic service and luxurious facilities. 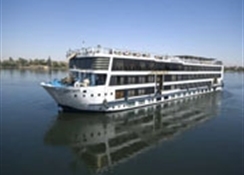 The cruise embarks from Luxor every Wednesday for 7 nights, where you spend your first night before beginning your journey down the Nile the following day. This superb boat offers extensive facilities equal to a first rate hotel with great dining options, fabulous entertainment and a lovely pool with sun deck and massage for relaxation. The stunning views of the Nile are enhanced by your surroundings and with cabins displaying the wow factor, the M/S Sunrise Semiramis 1 & 2, is definitely the way to cruise! 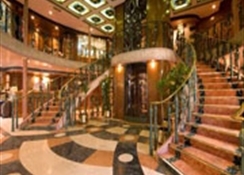 Getting to the cruise: You can book a transfer with hotels4u.com when you book your cruise. Alternatively if you wish to book a transfer only, please visit transfers4u.com. 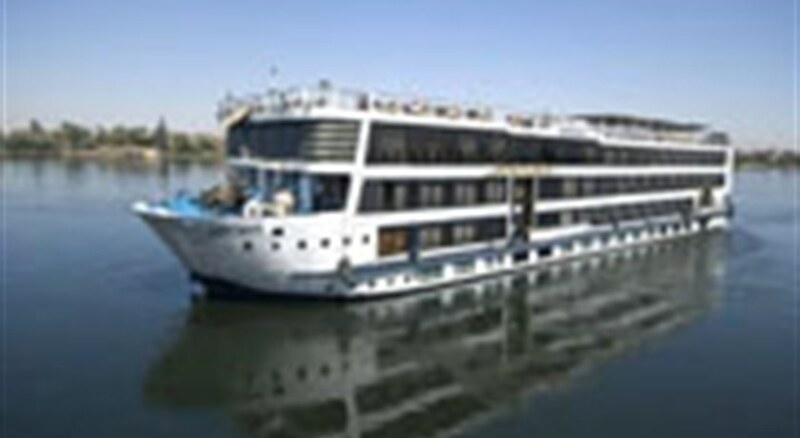 Please note, Nile cruises can only be booked for 4 or 7 night durations. Other durations will not be accepted. 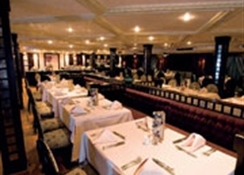 Food, drink and entertainment: The 5 star buffets with culinary highlight are served in the comfortable board restaurant. 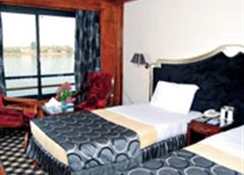 There is a lounge bar and a discotheque, and a sundeck bar with great views along the Nile. Sport, games and activities: A swimming pool, Jacuzzi, gym area and massage service for relaxation. There is also a reading lounge and billiards. Additional: This Cruiser has a 24 hours large reception area with safe boxes, concierge, bell captain, multilingual staff, doctor and a luggage room. A boutique, a souvenir shop and a jeweler for shopping on the Nile. check in Wednesday departure from Luxor on Friday at 13:00. The Nile Cruiser comprises 66 twin or double berth Cabins and 4 Suites which are slightly more spacious. Are all equipped with a telephone, satellite TV, music channel, individually controlled air-conditioning, a mini bar and a lounge area. 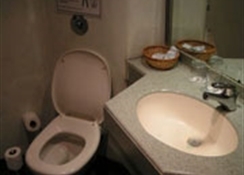 The luxury bathroom is equipped with a bathtub and shower and a hair dryer. Panorama windows offer a magnificent Nile view.